Keep your Chicago-area home cool throughout the summer with unique ceiling fans from Hortons. You’ll find a wide variety of indoor and outdoor ceiling fans, plus ceiling fans with light fixtures, control features, fan blades, and more. Gas and energy prices are rising again, and that means Americans must tighten their belts even further. You don’t need to dread hot summer temperatures and high utility bills when you have ceiling fans – your air conditioner’s best friend! If you already have fans in place, check to see whether they are ENERGY STAR® qualified. Ceiling fan/light combinations that have earned ENERGY STAR® accreditation are about 50 percent more efficient than non-conforming units. The difference lies in improved motors and blade designs. A model with an ENERGY STAR® light kit included provides even greater energy savings, and the bulbs don’t need to be changed as often. 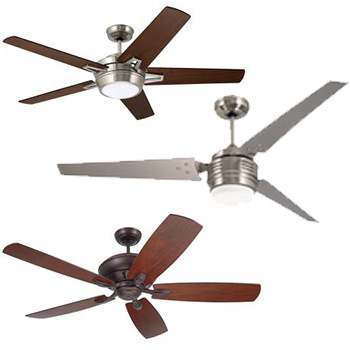 Look through our selection of ENERGY STAR® approved ceiling fans in our online catalog today! Ceiling Fan Tip: Adding a ceiling fan can improve air flow throughout any space. In the summer, ceiling fans provide a cooling effect. In the winter, ceiling fans can help circulate warm air.